Urban sprawl is one of Switzerland’s (few) biggest environmental problems. Since 1985, the population has grown by more than 30 percent, and since then, land of the size of the Lake Geneva has been plastered with concrete. In our interactive explainer «Bauland» we present facts and figures regarding urban sprawl, but the core element is a feature where the reader can choose its own municipality and then switch between different years to see how urban sprawl has changed its face. 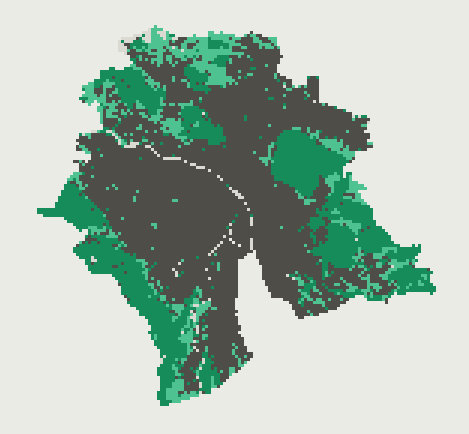 This visualization is based on a very detailed Swiss statistic, where every hectare (10k square meters) is surveyed every couple years and classified into categories forest (dark green), farmland (bright green), settlement (dark grey) and unproductive area such as glaciers (bright grey). The project was nominated as one of three projects in the prestigious Swiss Press Online Award 2017.